ePublishing Knowledge BaseePublishing Knowledge BaseePublishing Knowledge Base Creating, Managing, and Selling Products Why is my product requiring a user login when it gets added to the cart? If you find that a product keeps asking a potential customer to login when trying to add a product to the cart, it is possible that the product has a bad taxonomy association. 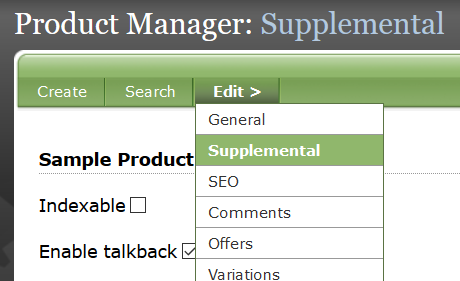 Find Classification taxonomies under Supplemental within the product in the Product Manager. 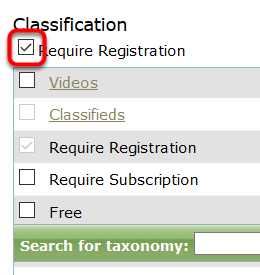 If your product is tagged as Require Registration or Require Subscription, simply click the checkbox next to that selection to remove the checkmark. Products should never use these taxonomies. Scroll down and click Save to retain your update. Products are the ONLY content type on the system that should never use these taxonomies. If you have any questions, please reach out to your project manager. Prev: How do I make sure customers create an account or are logged-in when buying products? Next: How do I give a user who has purchased a product made up of multiple downloadable files access to those files?